Leopold's Ice Cream / Scrapbook / From our team / Leopold’s Ice Cream Celebrates 99 Years of Tasty Memories! Saturday, August 18th 11am-7pm! 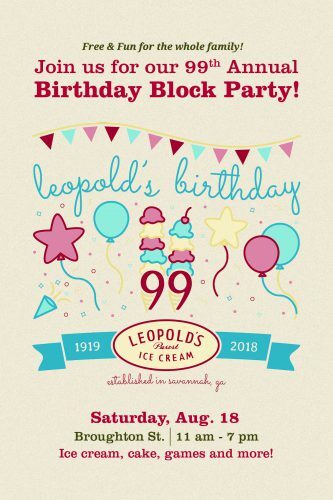 Help Us Celebrate 99 Years of Leopold’s Ice Cream! The Birthday Cake ice cream has been filled with rainbow sprinkles, the dance troupes are ready, the face painters have their brushes in hand and the DIRTT Kids’ Zone is stocked with free fun. That can only mean one thing … Birthday Block Party time at Leopold’s Ice Cream! This year we’re celebrating 99 years of Tasty Memories! Join us at 212 East Broughton Street for music, games, dancing in the street and our largest I Pledge for Ice Cream event ever! In recognition of our 99 years of ice cream, and to thank Savannah and our surrounding communities for their long and loyal support, Leopold’s will offer 99 cent single scoops all day. There’s also the chance to win a year of free ice cream in our photo contest, compliments of Hargray Communications Group, Inc.! New this year, Chatham Emergency Services will bring an ambulance and a ladder truck for the kids to explore. At 2:30, all kids are invited to join us for our largest I Pledge for Ice Cream event ever as we hang a huge American Flag from the 100-foot ladder truck. All participating kids will receive a free cup of ice cream! Also new to the 2018 event is the Doggie Oasis provided by Oliver Bentleys. Bring your pup to cool down with a free Doggie Sundae! This year’s DIRTT Kids’ Zone will feature free crafts, games and face painting by Glitterboxx Studios. The Live Oak Public Libraries will be on hand with great activities and Oatland Island will be bringing some of their animals to visit. A percentage of all t-shirt sales at the party will go towards helping Oatland Island as they recover from the EF1 tornado that touched down on July 27th. We’ll need kids (young and young at heart) to help us blow out the candles on our 99th birthday cake at 3 p.m. inside the shop. The party starts at 11am and continues until 7pm. Free and fun for the entire family! 11am – Let’s get this party started! 11:00 – 3:30pm – Visit with Chatham Emergency Services’ finest as they showcase their patriotic ambulance and a ladder truck. Immediately After – Dance with us in Broughton’s Longest Conga Line! 2:30 – I Pledge for Ice Cream under the giant American Flag – All kids welcome! 3:00 – Join us as we blow out the candles on Leopold’s 99th birthday cake! Inside the shop. 4 – 7pm – Dixieland Cruisers Classic Car Show on the east end of the festival. Old fashioned games, contests, music & general fun all day long! « Leopold’s Ice Cream Announces The 9th Annual Creative Writing Challenge!